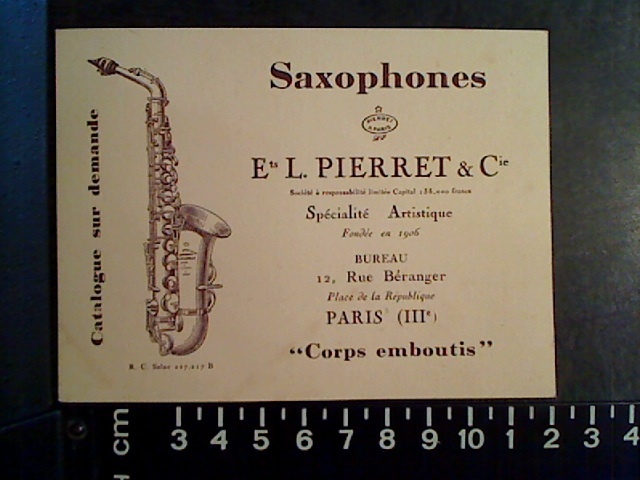 Pierret was a saxophone-only manufacturer located outside of Paris, France. They were in operation from 1906 until approximately 1972. Although not as wildly popular or nearly well known as Selmer, Pierret had a reputation for making fine saxophones. Even now in the vintage saxophone community they have some very loyal followers, and quite dedicated players. Besides making their own lines of instruments, Pierret also made stencil saxophones for Santy Runyon, Paul Buescher, Olds, as well as others. Over the years I’ve had a number of people contact me about their Pierret saxophones, many of which have been either identical or nearly identical to mine. A great many of these saxophones have been located in Canada. It makes one wonder if there wasn’t an importer here at one time or another, bringing C. Jeuffroy engraved Pierret saxophones into the country. Parisian Ambassador: probably from about 1963 on-wards. I have created a Pierret Gallery where all the different models that I have found to date are displayed.2 If you have a Pierret that you would like to contribute to gallery, please get in touch with me. Thanks! …the serial numberage may have changed to the traditional form in the late 1940’s—i.e. post WWII—when the Oxford was introduced, but starting with serial number 1. In other words, I can accept that there were approximately 50,000 Oxford and Artiste horns produced, especially when factoring in the various versions of each and the large amount of stencils of each, especially considering I’ve seen Super Artiste and Oxford horns with very low serial numberage. Another thing that Pierret did, that was rather unusual, was have 2 different lines of saxophones going at the same time. (Although Selmer has taken a page from this play book over the past few years as well, but in Selmer’s case they have a lot more than 2 different models of some voices of sax.) Pierret had one line would be a plain version—what they called Standard—while the other would have more features such as a front F key, additional trill keys, and/or a microtuner. These two different lines are nicely illustrated in this 1952 Hagstrom catalogue. Here the Super Artiste, and the Standard model of both alto and tenor saxophones, are being advertised together. 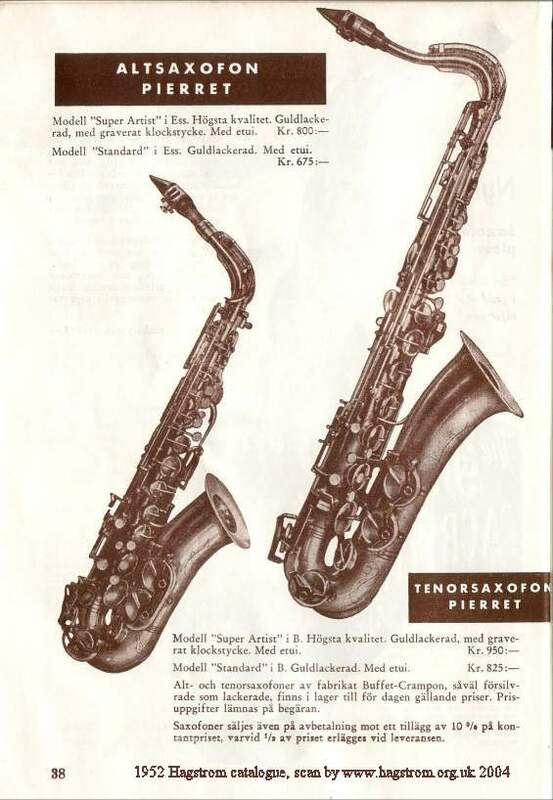 If you notice the prices of the saxophones in this vintage Hagstrom catalogue, there was not a significant difference between the Super Artiste and the Standard model. Not what one would expect, say between a student and a pro model. To my knowledge, Pierret did not make student model saxophones, although they did build different quality of instruments when requested. For example, when F.E. Olds & Sons contracted Pierret to build the Parisian model of saxophone, it was of a higher quality than the Parisian Ambassador. Notice how Olds describes their Pierret-made Parisian Ambassador in the following ad from 1963. It certainly had its fair share of features, and wasn’t built to be a shove it in the closet and forget about it horn. If you’d like to read more about the Pierret company history, including the variety of patents that Pierret acquired, I suggest you check out the Pierret History Page, on the Vintage Saxophone Gallery. All of Pete’s research is included there. 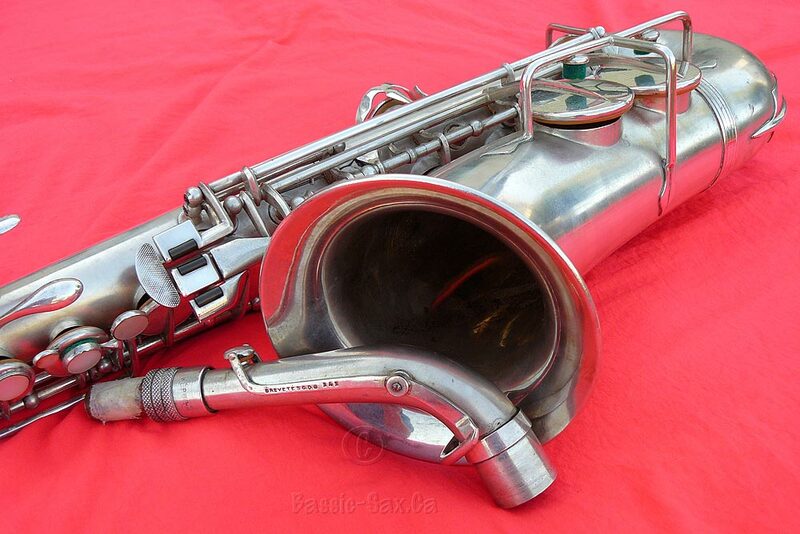 Be sure to check out the individual model pages for photos of the various Pierret saxophones. These pages can be found through the gallery’s table of contents page. 2 There is a much bigger, and searchable, Pierret gallery on Bassic Sax Pix. (The gallery portion of my website.) I encourage you to check it out if you’re looking for Pierret images.